Fundamental questions: What does ‘evolution’ actually mean? How does the idea of evolution differ from other ideas about species? What evidence can we see for evolution? Homologous features: Structural similarities that underlie features in two different organisms eg. forelimbs of vertebrates. 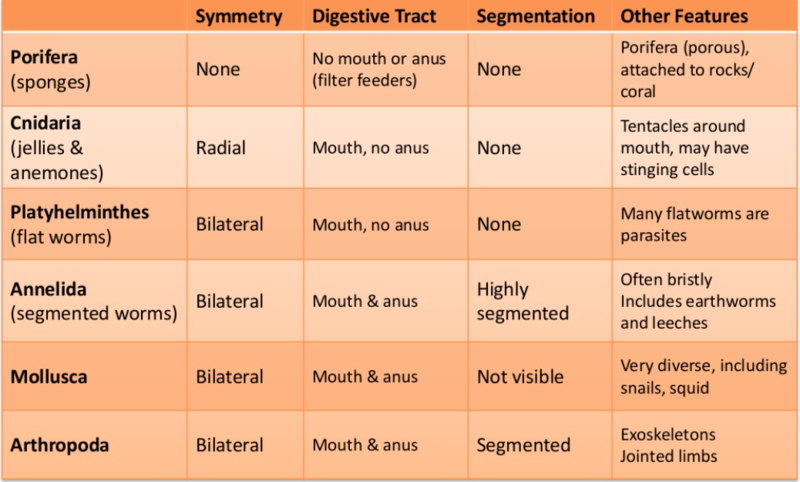 Analogous features: Functional similarities combined with quite different underlying structural designs eg. an insects wings, and a birds wings. Geological time-period. A period of geological time associated with the formation of certain rock layers eg. Mesozoic. Evolution means ‘change’, and encapsulates the idea that the characteristics of species are not fixed in time; but that they have changed, and may continue to change. We have actually observed some modern examples of how organisms can change eg. wolves -) domestic dogs, antibiotic resistance in bacteria. Virtual online Lab: Follow this online lab following a field trip to the Caribbean analysing species of lizards for the purposes of classification and the enhanced understanding of their evolution. Natural selection: a mechanism through which evolution may occur. 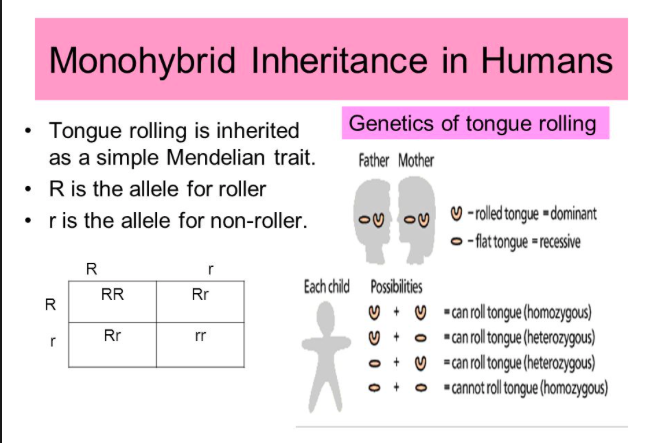 Heritable characteristics: Characteristics that may be passed on to the next generation. Introduction: Read the article on ‘industrial melanism’ on page 248. Summarise the salient features of the article in a paragraph. Natural selection is the mechanism famously proposed by Charles Darwin to explain how evolution may occur. Natural selection increases the frequency of characteristics that make individuals better adapted and decreases the frequency of other characteristics leading to changes within the species. Natural selection: Watch and discuss this video. Summarise the meaning of three ecological concepts: descent with modification, common descent, and natural selection. Variation. Natural selection can only occur if there is variation amongst members of the same species. Species tend to produce more offspring than the environment can support. Natural selection is only possible if there is a struggle for survival. The characteristics that made them successful are passed on and become more common in the next generation – hence the change, or evolution. Evolution by natural selection leads to gradual, progressive change. It is important to note that natural selection works at the level of the population, not the individual. ie. It is not that one giraffe’s neck becomes longer. It is that in the population of giraffes, the frequency of giraffe’s with longer necks, becomes greater over time. Activity: review this powerpoint on evolution. A bacterial population with no resistance to an antibiotic may develop into a bacterial population with some resistance to an antibiotic. Which event could lead to this? A. Antibiotic resistance was inherited from an ancestral population. B. An antibiotic resistance plasmid is received from a bacterium in another population. C. The enzyme needed for antibiotic resistance is received from a bacterium in another population. 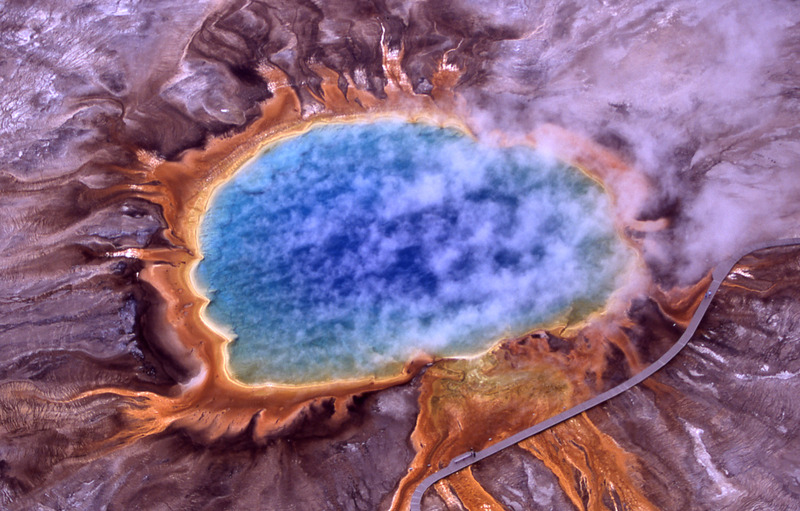 D. The bacterial population mutated in response to antibiotics in the environment. What is a direct consequence of the overproduction of offspring? A. Individuals become more adapted to the environment. B. They will be subject to intraspecific competition. C. They will diverge to produce different species. D. They will suffer mutations. The photograph shows vegetation in a rocky area. 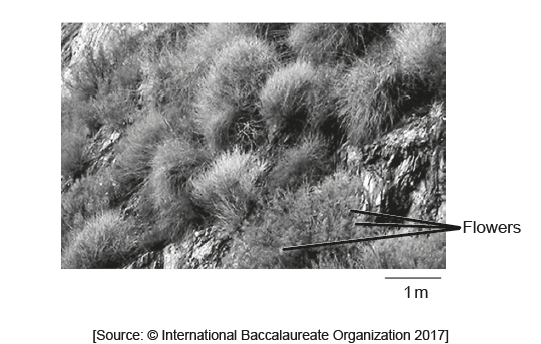 Which characteristic of the plants indicates that the area in which they are growing is probably dry? The following has been provided as an example answer. Organisms with the desirable traits are chosen to breed with each other. Organisms without the desirable traits are not chosen to breed with each other. The offspring of the breeding pair are screened for desirable traits. The process repeats itself. EQ5.3a Why should classification systems in science be standard throughout the world? Hierarchy of taxa: the order of groups from most inclusive to least inclusive: Domain, Kingdom, Phyla, Class, Order, Family, Genus, Species. Artifical classification: When classification is based purely on arbitrary groups (eg. 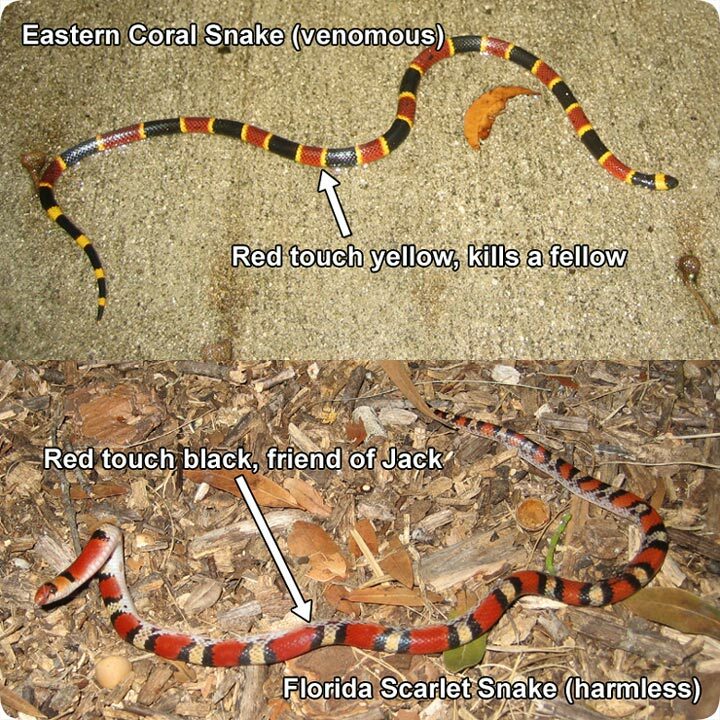 for identifying venemous snakes). Make a list of around 5 groups that your school has placed you in, for the purposes of organising your education. Classify yourself according to each level of organisation eg. Grade level – 11. Make a rule that explains the relationship between your classification any one group and the group above it. Make a rule that explains the relationship between your classification any one group and the group below it. It is universal and can be used by all scientists. The genus name is a classification group (and gives you information about the animals). Discussion Task: Choose 1 or 2. Q1. Did western scientists imposed the modern classification species system on the world? Q2. 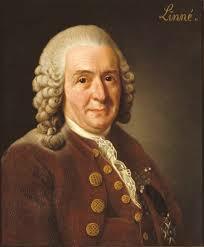 Carolus Linnaeus also classified humans into 4 groups. By 21st century standards, his descriptions can be seen as racis. How does the social context of scientific work affect the methods and findings of research? Two names (hence bi-nomial), for each species. Genus and species eg. Homo sapiens Homo – Genus, and sapiens – species. The binomial system of names is universal amongst biologists and has been agreed and developed at a number of congresses. Capitol letter for Genus, lower case letter for species.Use italics if typed, underline if hand written.There exists a hierarchy of taxonomic groups, which is used to classify living organisms.You can see the taxonomic hierarchy for a human and an ostrich below. Did King Philip Come Over For Good Soup (Mmemonic for the above). Traditionally, all bacteria were placed one kingdom – Prokaryotes. It has since been realised that the diversity of bacteria is too high to realistically place them in one category. There is a group of ancient bacteria called Archaens, which are very different to other bacteria and probably were among the first living organisms on Earth. They are now considered to be a separate domain. Prokaryotes: Containing ‘true bacteria’ such as E. Coli. 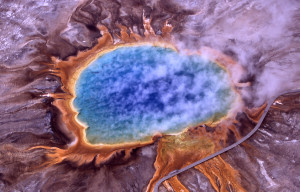 Archaens are often found living in extreme environments, for example this hot springs in Yellowstone national park, USA. They also include methagens (bacteria which produce methane gas as part of their metabolism), this means they are found in the intestines of cows (and humans), and in the guts of termites, and are responsible for the methane emissions of wetlands. A natural classification system, the genus and higher taxa consist of all the species that have evolved from one common ancestral species. In other words, evolutionary relationships is the basis for that classification. Which penguins are more closely related by a more recent common ancestor? In an artificial classification system, species are placed into groups based on arbitray classifications (subjective, and not due to evolutionary relationships). Q) How could artificial classification systems be useful? Need more help? REVISION Powerpoint on Topic 5. Big questions: How do we quickly classify plants and animals into classification groups into phyla, based on a casual observation? 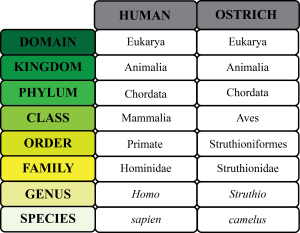 Dichotomous key: a chart for identifying species, based on the principle of splitting the species into two using a question which has two answers. Natural classification: classification system based on the closely related groups evolving from a common ancestor. Share with the class: Are these systems of classification useful in any context? Without using knowledge of evolution, we are likely to come up with an artificial classification system – that is, based on arbitrary criteria. This may be convenient for us in some circumstances (eg. 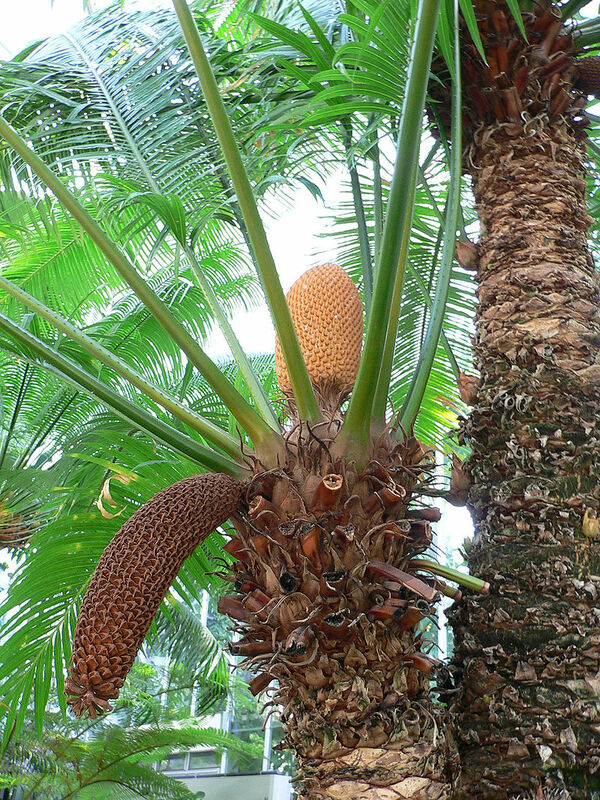 dangerous or not for jungle tourism), but has less biological value. 2. Because the members of a group have evolved from a common ancestor, they are likely to have shared characteristics. This allows prediction of the characteristics of species within a group. 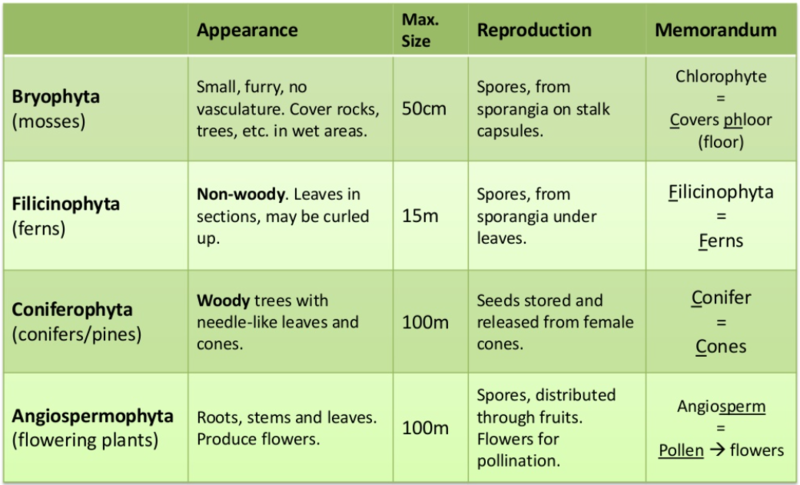 The recognisable features of a phyla of plants or animals, are the characteristics that are easy to see and will help you to quickly understand which phyla a specimen belongs too. 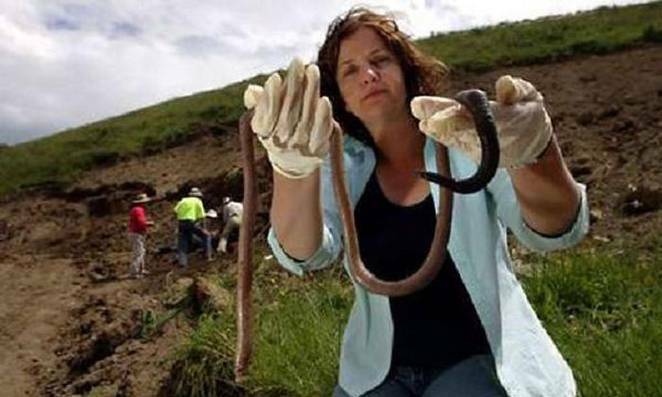 The Giant Australian worm grows over a metre long. What phyla of invertebrate do you think it belongs to? Big questions: Is classification by common ancestors a better way of classifying species? How reliable are cladograms? 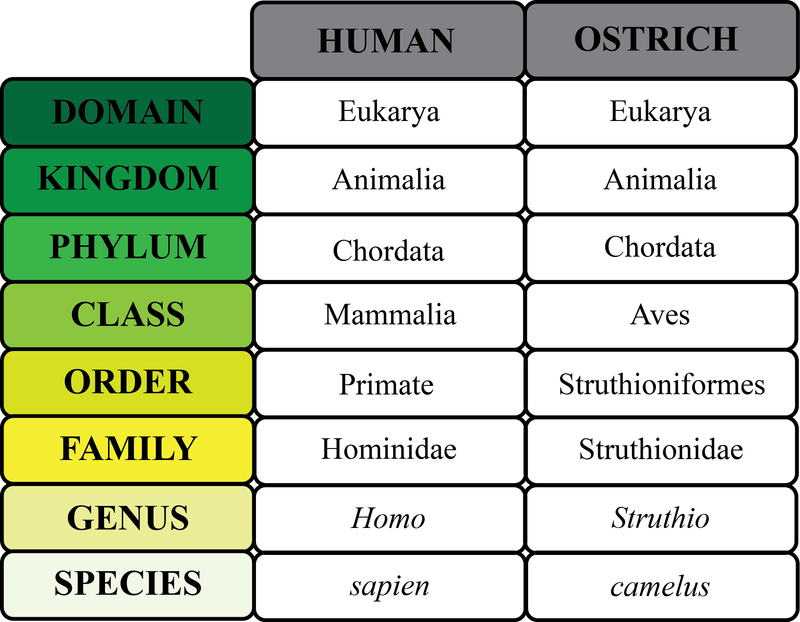 Cladistics is the classification of organisms based on clades. A clade is a group of organisms that have evolved from a common ancestor. Q) How do they know that the organisms in a clade have a common ancestor? A) they know because the organisms share base sequences of genes, or the amino acid sequences of a protein. A cladogram is a tree diagram showing the most probable sequence of divergence in clades. 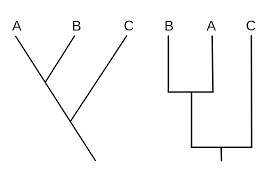 The cladogram shows the divergence of groups A, B, C. These two formats of cladograms are both acceptable. The points where they diverge, are called nodes. Each node represents a hypothetical common ancestor. OK, so why most probable? They are not always certain, there may be more than one possible interpretation of the data depending on which genes are used in the study. So, divergence? This means when the two groups of organisms stopped being the same, and started to have different characteristics (this idea links with speciation, as discussed previously). Look at this example of a cladogram. Explanation of cladogram: Using physiological features as a basis for this cladogram, how do they know the probable sequence of evolution? They use the fossil record. 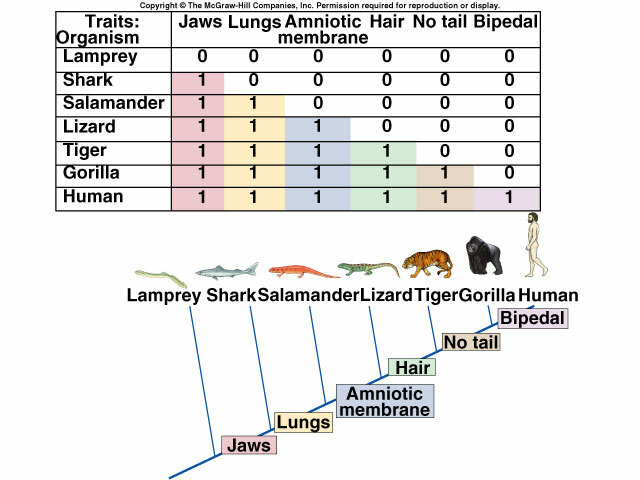 In the figure above, because the characteristic ‘having jaws’ is the oldest characteristic to appear in the fossil record, we know animals evolved them before lungs. In the table, the species are organised in order of how many of these extra features that they have. In this way we can track when species diverged eg. Sharks diverged before the evolution of lungs. Q) How is this different to other forms of classification? A) Traditional classification depends on physiology (the way that the body is designed and how it functions), and morphology (the shape of the body parts). Sometimes there is a discrepancy between traditional classification, and the newer classification of organisms by cladistics. OOPS- this has led to massive reclassifications of plants! Nature of science: Do you think it is advisable to re-classify organisms based on cladistics?? 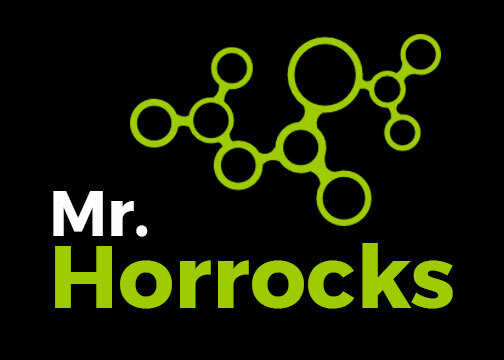 Homolous traits eg. dolfins flipper and mammalian arm, have similar physiology because of a common ancestor. Analogous traits are similar because of convergent evolution, they evolved separately to become similar eg. insects wings and bats wings. Q.) Are organisms that share homologous structures more likely to be in the same clade, or organisms that share analogous structures? A). Organisms that share homologous structures, because the clade shows a group of organisms with a similar evolutionary history. Objectives: judge the implications for human evolution of cladograms involving primates AND understand how one cladogram may not be enough AND appreciate that cladistics have caused the re-classification of the figwort family. Primates: a family of mammals that includes monkeys, apes, and humans. Objectives: Learn how to make a dichotomous key. Also learn how to use dichotomous keys to identify specimens. Dichotomous key: A numbered series of pairs of descriptions, which can be followed to identify a specimen. Introduction: Read page 265 Dichotomous keys and the dugong. Be prepared to summarise the key features of a dichotomous key. Activity: The lesson will follow slides 41-58 in the classification powerpoint above. The you will be asked to create keys to help your friends identify the phyla, for example sharks.